Cook chicken for several hours on low heat. When chicken is cooked, cut up chicken or shred it in a bowl and 1 tablespoon of sour cream. ( I also scoop out the tomatoes from chicken and add to it)In a saucepan add remaining sour cream and cream of chicken soup together and heat until warm. 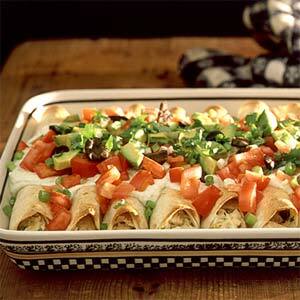 Roll chicken into flour tortillas and line in pan. 8 X 8 if making 5-6 enchilldas or bigger pan if making more. When sour cream mixture is heated pour over enchilldas and top with grated cheese. Bake at 350 for about 30 minutes until bubbly and cheese is melted.